The Order of Knights of Sant' Iago was originally founded in 1170 to protect pilgrims travelling to Santiago de Compostella. A Portuguese branch of the order was founded in 1290. In 1862 this order became an Order of Merit awarded to Portuguese and foreigners for achievement or noted service in the fields of science, literature and the arts. Membership of this Order was awarded to John Charles Robinson (1824-1913), curator, scholar and collector, who worked at the V&A in its earliest days and was a very important figure in the formation of the collections. This badge has the inscription 'SCIENCIAS LETRAS E ARTES' (Science, literature and the arts). Decoration in the form of a red enamelled fleury cross, the lower arm forming a sword. 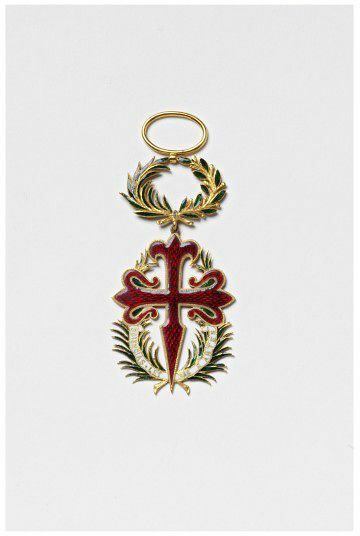 The cross rests on two green enamelled palm branches which meet at the base and support a white enamelled scroll with an inscription. 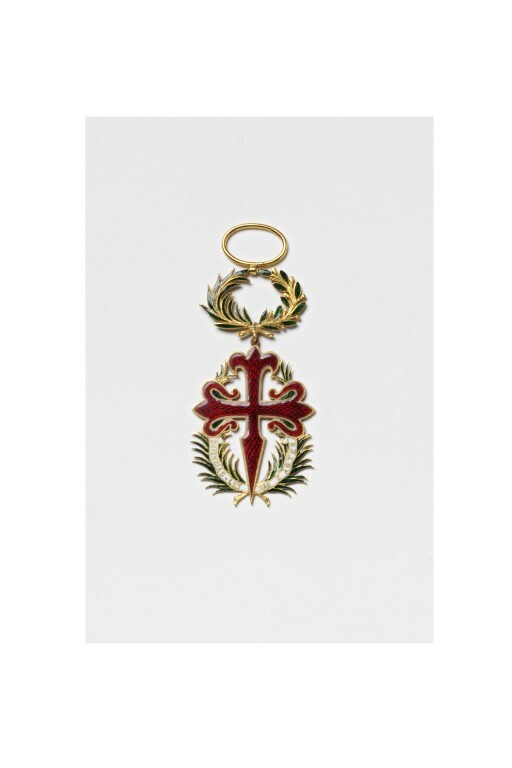 The cross depends from a green enamelled suspension ring in the form of a laurel wreath, and from a further plain gold ring. This decoration was given to J.C. Robinson during his lifetime. Given together with A.1 to A.14, by Gerald Robinson. The Order of Sant' Iago started as an order of Knights founded in 1170 to protect pilgrims travelling to Santiago de Compostella in Spain. 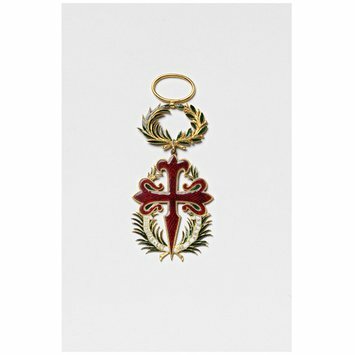 A Portuguese branch of the order was founded in 1290. In 1862 this order became an Order of Merit for science, literature and the arts, awarded to Portuguese and foreigners for services in those fields. Orders, Medals and Decorations of Britain and Europe, Paul Hieronymussen, London, 1966.